National Jelly Belly Day is April 22, 2015. We will be celebrating this amazing holiday on Wednesday April 22, 2015 thru Friday April 24, 2015. Come spin the wheel, win a prize, taste test Jelly Belly beans and have a fun time! You just might win the big prize! Show your appreciation to all of your Administrative Professionals on April 22, 2015. Whether you want to say thank you for keeping you organized, on top or on time, right now is the perfect way for you to show your gratitude. 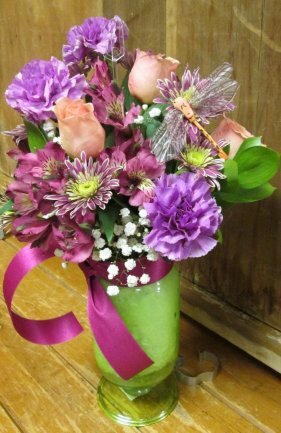 Our "Smile and Shine" mason jar bokay with vibrant colors will brighten their day and the office! Bokay's starting at 20.00. To place your order call 307 786-2652. Now don't you just love being smarter than your friends and family? I know I sure do! So I will share with you some fun facts about Jelly Belly. It is always great to learn something new each day! 1. There are only 4 calories in 1 Jelly Belly! 2. It takes 7-14 days to make a Jelly Belly! 3. It takes only 3 days to make an old fashioned belly bean. 4. In 1983, Jelly Belly jelly beans were sent on the space shuttle, Challenger mission by President Reagan, making them the first Jelly Belly's in space. 5. Christmas is the second largest jelly bean eating season of the year. 6. There are 15 Billion Jelly Belly's eaten each year.